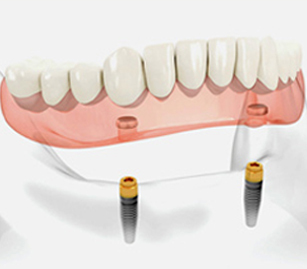 Implant Supported Dentures Are Easier Than You Think! When individuals come to the point of replacing their teeth, they often think that their only options are getting traditional dentures or implants. In many cases, the two of them can be combined. Although some people think implants are a cosmetic procedure, they’re actually a restorative necessity that can tremendously improve your smile and quality of life. Now, modern dentures are nothing to be unhappy with. They restore function and beauty to your teeth, helping you feel more confident with a healthy-looking smile. But if you have an irregularly shaped jaw, bone loss, or “tori” (bony growth in your mouth,) you may have more difficulty stabilizing and feeling comfortable in a traditional overdenture. Thanks to modern dentistry, there is an option that merges the best of both worlds, allowing our Toronto denture patients to have a durable and secure denture, stabilized by an implant. Traditional dentures are typically a resin base with dental crowns that rests on the lower gums and held into your mouth by creating a suction against your gum tissue. They are a great solution to tooth loss for many people. But if the loss happens at a younger age or our patient has a peculiarly shaped jaw or palate, a different long-term denture solution may be a better choice. Implant retained dentures work differently. Yes, they replace all of the teeth at once, but they take up much less space inside of your mouth. Though the crowns are still resting in a resin base, they are fixed in the mouth by a set of implants. This characteristic provides several benefits over traditional dentures. 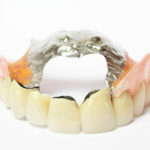 Greater Stability: Implant retained dentures with our Toronto Denturist don’t slip or slide around your mouth. Traditional “plates” may shift while you talk. They take some time to get used to, and the fit will change over time. But implant retained dentures have an anchor to keep them from shifting. This means it’s easier to speak with confidence, and without lisping. Eating Is Easier: The anchor that keeps a hybrid denture or overdenture from moving also provides more stability for chewing and eating. With traditional dentures, it’s difficult to take bites of hard foods like apples or carrots. The implant stabilized denture gives you greater range of food to eat, because you have more power to your bite. Foods that are hard to chew are back on the menu. Tough and tasty foods like red meat are all fine to eat, though with smaller bites than when you had natural teeth. Since the biting forces are absorbed by the implants, you’ll be able to chew more naturally! Your Tastebuds Will Thank You: One frequent complaint from denture wearers is that foods just don’t taste the same. The reason for this is that the acrylic that creates the upper arch covers the palate (roof of your mouth) in order to be held on by suction. Unfortunately, covering the palate dulls the way flavors may be perceived through the olfactory senses. An implant retained denture has no need of the palate cover, since the implants keep it in place; it follows more of a “U” shaped, streamline design. No More Discomfort or Mouth Sores: The acrylic base of a traditional set of dentures can rub uncomfortably on your gums, especially if they don’t fit well. The tissue supports the prosthetic device, but it only works to an extent. Gums are soft tissues that are easily damaged and can become sore. Even the jaw bone beneath the gums are inadequate to support a denture in the long term since they change shape and may lose density. The implants from implant retained dentures assist by making the jaw bone more stable in shape and density. No Need for Extra Products. 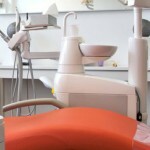 Traditional denture wearers often rely on additional products like adhesive creams or pastes. They help keep the denture in place during the day and have to be cleaned off at night. Implant retained dentures have no need for adhesive since the dental implant holds them in place all day long. When you get to the point that you need to have dentures, or if you’re ready to make a positive change for the sake of stability, Dentures Direct Implant Denture Clinic can help. A consultation is just the beginning to changing the way you chew! 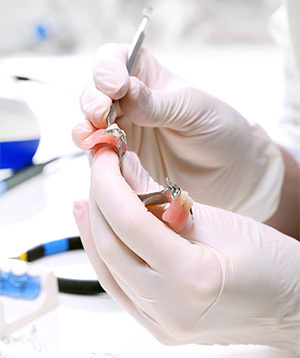 Here are some things you should know about the process of getting implant retained dentures in Toronto. Whether you’re getting individual implants or dentures retained by implants, the process can take upwards of six months to a year, depending on your specific situation. Why so long? We have to allow time for healing and implant integration with your body. Moving directly from tooth extraction to implants is the quickest way to having functioning teeth again. Even then, it can take six months for the implants to bond or osseointegrate with the jaw bone. You need them to integrate to provide permanent stability. The force you use for biting and chewing can damage the implants and your jaw if not allowed to heal fully before attaching the denture. In some cases, we can use sterile bone granules, in other cases, we need to take a small sampling of bone from elsewhere in your body, like the back of your jaw or even the hip. Any bone graft can increase the total time by up to six months, but having a stable bite and a confident smile is worth it! Are you ready to make the change to implant retained dentures? Whether you’re looking at a first denture, or you want to improve your current dental experience, you need a qualified and experienced denture specialist to provide the best care. In Toronto, the best denturist team at Denture Direct is here to provide comprehensive and gentle care for your smile. 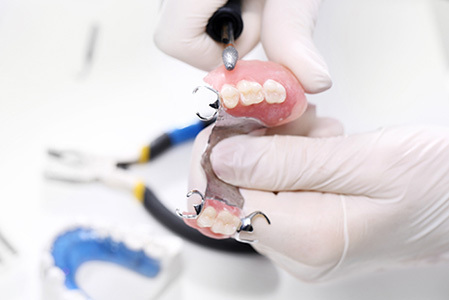 Whether you want to change to implant retained dentures or simply adjust the fit of your current prosthesis, our providers are happy to assist you. Contact our Etobicoke clinic for a free consultation with our team and find out how well dentures could work for you!